Before this weekend, I had been to 18 AFL games. All of them had been played within Sydney. I had always wondered what it would be like to enjoy the game in Football Central, and just wished that one day, the time would come, when I would be able to enjoy a game in Melbourne, and even better, maybe a really close game. So when my parents revealed that we would be going to Melbourne for the weekend, and also, the game against North Melbourne, I was extremely stoked. First of all, it was a game both teams needed to win. 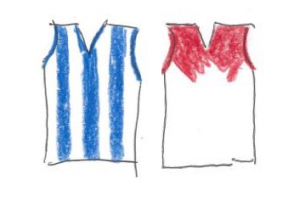 North Melbourne were one of the teams hovering in no-man’s land, just below the top eight, while Sydney needed to reaffirm themselves as genuine threats to the competition, after two poor displays against the Cats and the Wild Cats. Also, as it was being played at Docklands, I would be able to sit under the dome for the first time, and enjoy a fantastic atmosphere, being able to hear the crowd noises echo off the walls around the ground. It was set up to be a cracker of a game. The great thing was tht our hotel was right across the street from the ground, so we did not need to leave super early. As we walked through Southern Cross Station, I could not help but notice an all-out AFL store. I could not believe my eyes! Why can’t they have something like this back in Sydney? Does anybody even care about League? Anyway, I got a Swans hoodie, and my sister got herself a Luke (Parka). Then it was off to the game. We got fantastic seats in Level 2, Aisle 41. They were not too high to feel isolated from the rest of the crowd, but they were also elevated just enough to get a full view of the ground. In addition, we have great company, with several Swans supporters surrounding us. Bring it on! The crowd starts very quietly as the ball is bounced in the centre. North Melbourne press up, but the first scoring opportunity is created, with Parker’s clever stab kick managing to hit Ben Ronke, who converts calmly. The kid just knows where he needs to be, and always pops up in the right spot. I notice that the two Sudanese boys are matched up against each other. I can already tell that these two will put on a great show today. North respond quickly with two, but we hit back with two of our own, with our two returning stars, Papley and Heeney. However, the ‘Roos do make it to quarter time with a 12 point lead. The second term starts with a bang, as Hayward snaps a freak goal within the first thirty seconds. Then, in comes young Ronke again, who is fast becoming my favourite player, who kicks two brilliant crumbing goals in quick succession. Even before he debuted, there was something about him which I have loved. Maybe it was just his name, I don’t know. Buddy is unusually quiet in the first half, and my family is anticipating his 900th goal. It does not come in the first half, unfortunately. The crowd starts to fill in more, and the noise elevates as the game reaches half-time, and our boys lead by just over two kicks. But of course we knew that North would hit back hard. Majak Daw did not look like dropping a ball, and every time he got near the ball, we would feel terrified. But after a few goals to the Enemy, Ronke hits back with his fourth, and Buddy enters the fray for the first time. From his pocket, Lance drills it through the sticks, and we rise as one for his 900th major. What a champion he is! But North do not conform. Brown and Daw just keep clunking them, and that bloody Jack Ziebell is working like an ant on the ground. In the final quarter, we are all worried sick. North have a healthy 11 point lead. But the Swans hit back real hard, as Heens and Foxy convert, and after a while, it is back on level terms. Enter the great Buddy Franklin. First, he bombs one from his signature spot, and then he dribbles one close to the boundary, and we are up by two kicks. Everyone around us is going berserk. But Majak Daw and Ziebell continue the Kangaroo’s fightback. All of a sudden, they lead it by seven points. I bury my face in my palms. I have already seen us choke against this mob this season. This cannot be happening again, surely? We know that there can only be minutes left, so we need a goal soon. We thrust it forward, and who should crumb the goal? It had to be Big Benny Ronke with a handful! Etihad Stadium was a chilling place to be! At the centre bounce, Parker receives a misdirected Goldstein tap, and sends it in the Ronke direction. Red and white starts to wave around and the noise elevates rapidly as he gathers the ball and snaps it around the body. We are all yelling at the top of our lungs in the most palpitating energy, until we realise he has pulled it across the face. Scores are level. To put it mildly, I was shitting bricks. As North eject it from their defensive 50, it comes straight back in, and I start yelling as loud as I possibly can. “ANY SCORE!” And no, I would be lying if I said I felt remorse for the kid in front of me who kept looking at me funny. The ball manages to get out the back, to Aliir. He has been beaten all day by big Maj, and this is his moment. It was almost like it happened in slow motion. He held onto the ball for a while, and we all knew what was going to happen. He banged the ball down onto his boot, and slammed through the matchwinner. I have completely lost my voice, which seems to be about par for me at Swans games, but I completely fried my voice when this goal was kicked. My mum and dad were cheering loudly, and everyone was overjoyed. “YEAHHHHH!!!!!! YEAHHHHHHH!!!! !” I yelled. The Swannies held on for a gripping victory. I have been following AFL for the past six years (I started pretty late), and in that time, i have had my fair share of close games. There was of course, Sydney’s great come-from-behind victory against Essendon in 2015, and our heartbreaking loss last time we played North. But I can proudly say that my one AFL experience in Melbourne happened to be the best game I had ever been to, hands down. And hats off to our very own Aliir Aliir. Could not get back into the team for eighteen months, but he managed to pull out a David Zaharakis, and kick his first goal when the match was there for the taking. By the time you read this, I will be back in Sydney, relaxing peacefully in my bed. What a trip to Melbourne it was, and i can only hope that I can go back there again for another classic Aussie Rules match. COME ON, SWANNIE, COME ON!!!!!!!!!!!!!!! Was a great win, especially being your first game in the home of footy, Melbourne! Hope you have more.